Designed for your health, safety & well-being! 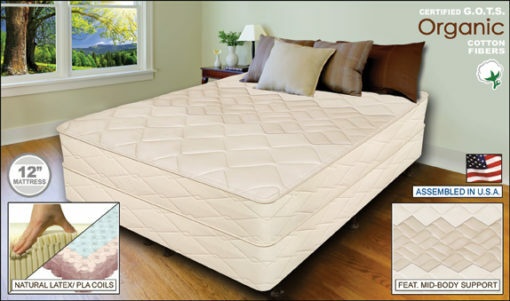 The Organic Elements Collection Elite Natural Latex & Coil mattress was designed and handcrafted with the health and eco-conscious person in mind – by building a mattress with as many natural, sustainable and organic elements as we could source. This mattress is built without dangerous chemicals or toxic substances (unlike many conventional mattresses in the marketplace) in order to give yourself and/or your family a much healthier and safer sleeping environment!